Running is good for the heart — this isn’t groundbreaking news. Running helps the heart pump stronger and more efficiently, it lowers the the production of glucose which can lead to diabetes, and it helps prevent heart disease. But most people think of benefits in strictly biological terms. Running is good for your heart, but not just with regard to oxygen molecules in your bloodstream. Running helps my heart in every sense of the phrase, and it helps me become a whole person — sane, grounded, inspired, connected. A few weeks ago I returned home to Minneapolis, and my heart was completely full of laughter and love and happiness. I reconnected with family and loved ones. I shared a meal with the woman who inspired me to run my first marathon, then the next morning I ran with the friend with whom I trained for that very same race. My trusty spreadsheet dictated that I run 20 miles while on vacation, so I completed my longest training run on my home turf. I loved every second of it. I ran through my old neighborhood. I revisited trails I used to train on. 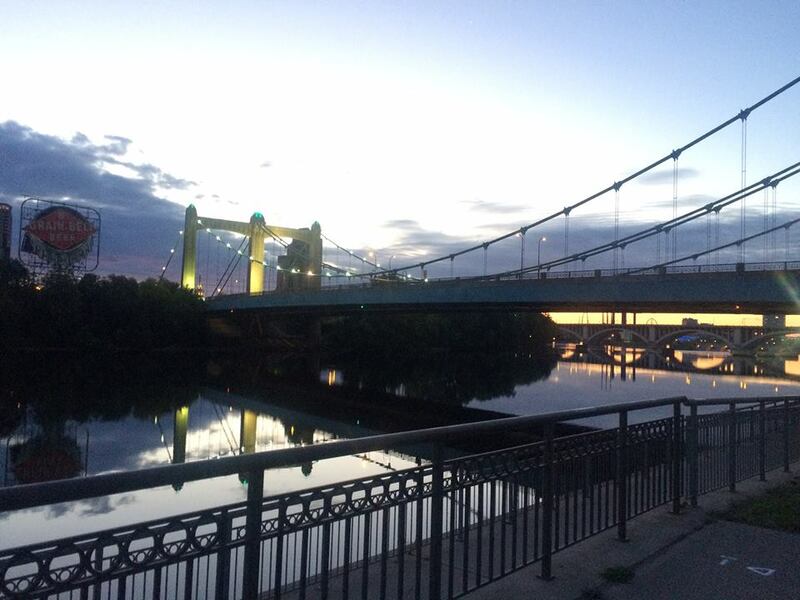 I watched the sun rise over the Mississippi River, and remembered the joy I felt running when I was younger. I never felt fatigued or exhausted. Nostalgia is one hell of a motivator. The trip home was a shot in the heart, in the best way possible. I’ve carried that joy and inspiration with me during my two week taper, and I’ll carry it with me tomorrow as I embark on 26.2 miles. As I mentally prepare for tomorrow, I find myself looking back. This will be my third marathon ever, and my second attempt at the Portland Marathon. Last year’s race did not go well, but I’ve trained harder and smarter this year, and I’m ready for redemption. I put my heart more into training this time — connecting with nature on weekly training hikes, connecting with spirituality during yoga, and connecting with myself during each run by staying mindful and being honest about what my body can and can’t do. I’ll cross the starting line tomorrow with strong body, clear mind, and full heart. Training for this race has been more joyful and inspiring than anything I’ve trained for in the past. With no injuries and no excuses, I know I’m capable of redeeming myself from last year. When I face the inevitable wall, I can tap into the amazing memories during the training process, and use that as fuel to keep going. My heart knows I can do this even when my body says I can’t. Crossing the finish line will not only mean that I met my personal goal, but that I’m connected to something bigger. I’m connected to the running community, and to the organizers and volunteers of the marathon. I’m also connected with a more honest version of myself — training for this event has gotten me out of bed on days when I wanted to hide under the covers, it’s kept me motivated to push forward when I wanted to quit. There’s no doubt that running is good for the heart, but as I reflect on how much it’s helped me — this year more so than ever — I know it’s also good for the soul.